We’re delighted to welcome three summer researchers into the Department, Carmen Martinez-Freile, Sigrid Dalland and Louise Lee. The diversity of their research topics demonstrates the scope of the Department’s research. Carmen and Sigrid have just finished their Part 2 year and are working on projects funded by the University’s Research Opportunities Programme, UROP. Carmen is working with Jeanne-Louise Moys, carrying out research, on the design of images used in rehabilitation for people with language impairments, typically in recovery from strokes. She has said ‘It’s exciting to be working on a project with real world applications’. 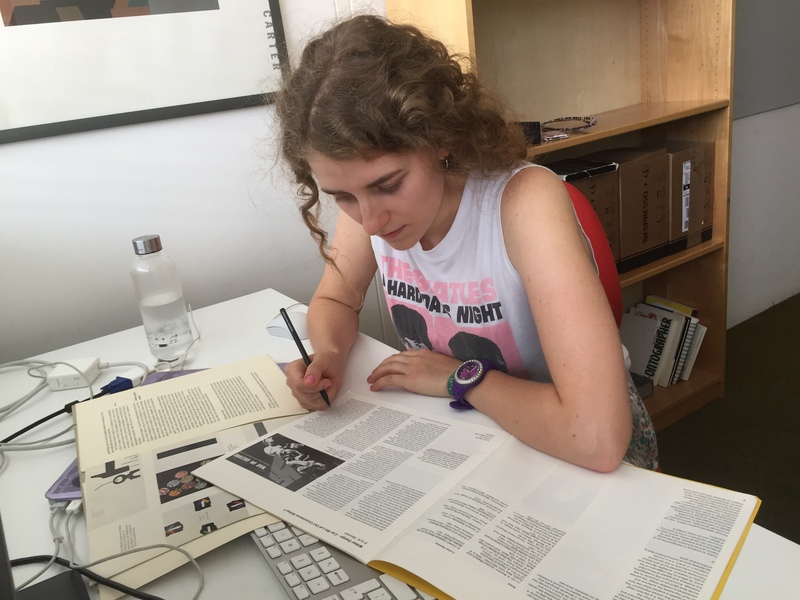 Sigrid (pictured) is working with Rob Banham, compiling an annotated bibliography of the writings of 20th century graphic designer, FHK Henrion. Louise, who has recently graduated, is working with Alison Black on the design of probabilistic maps, as part of the NERC project, ERADACS, which is examining the development and communication of soil moisture forecasts to improve resilience to the drought in sub-Saharan Africa. Louise has commented ‘It’s very different from my student experience, and has been interesting to be immersed in Departmental Research’. We wish them well for the summer. This entry was posted in Announce, Research. Bookmark the permalink.